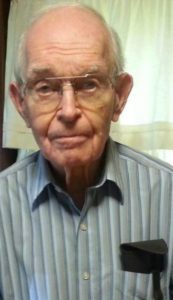 Erwin Ohrom TARKINGTON, age 95, of Four Oaks passed away Sept. 11, 1018. A WWII veteran he is survived by his wife of 44 years, Mina Gray; his children, Richard E. Tarkington, Timothy O. Tarkington, Susan L. Aidman and William R. Tarkington; his grandchildren Ellyn Scanlan, Andrew R. Aidman and Suzannah L. Tarkington; his great-grandchild Aiden Scanlan; his step-daughter, Teresa Browning and her husband Donald; his step-daughter Jan Hilburn; two grandchildren and eight great-grandchildren. He is preceded in death by two grandchildren: Joshua Clint Browning and Melissa Renee McCullen. The family will receive friends at Parrish Funeral Home in Selma on Thursday, Sept. 20, from 6 to 8 PM. A graveside service will be held on Friday, Sept. 21, at 11:00 AM in Sunset Memorial Park in Smithfield.